To stay up-to-date all the time i suggest you to join the Discord Server, there you can more easily find me and i probably will react faster to new comments than when commenting here. What Versions does this Resourcepack support? For a list of all supported Versions check out the Downloads Page. What is this Resourcepack and what does it offer? This Resourcepack is like Default with my own touch. 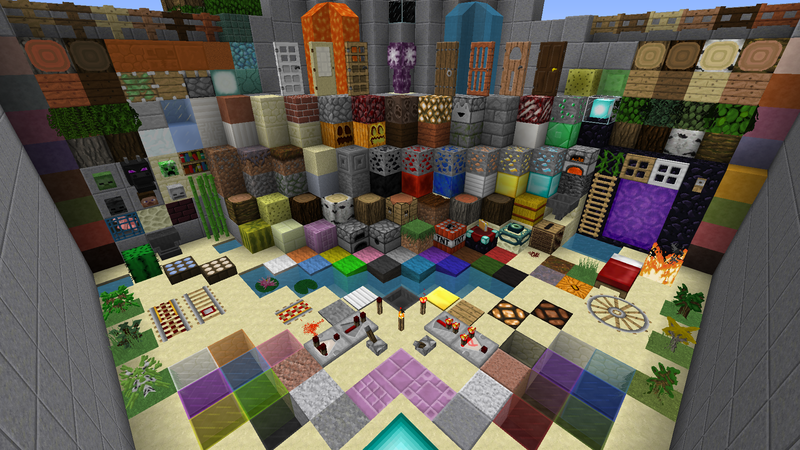 But the Textures are more detailed many things have additional Animations or other Features added to them with Addons such as Connected Textures, Beautiful Skies or different Mob Skins. Also if you don't like my own Touch and want everything to be exactly like Default there also is an additional Addon for that. Does this Resourcepack support Mods? Sadly i don't have that much free time to keep updating mods however some amazing people here post thier selfmade Mod Supports for thier favourite Mods which is very great! How did you get the idea of creating this Resourcepack? Back when i haven't learned how to make textures i used Faithful 32x Vattic nearly daily. However seeing 64x64 Packs like Misa kinda let me start to want 64x64 Textures too. after a while i started learning how to make Textures and how to modify Minecraft ones. So after learning a lot and creating a lot of crappy textures i decided to take the idea from Vattic but make it 64x64 styled to fit my Gameplay. Was private for a long time, when i posted it on the Forum it used to be really bad so it got deleted, there was some time when i stopped playing minecraft however when i started it again i immediately also started updating my texturepack again and after a year and some months it was finished. Since when did you work on this? As i used to work on this Resourcepack to kill boredom i am actually working on this pack since some Years. however i was kinda lazy and never finished it and when i was just about to finish it there was an update adding new content that made me want to scrap the idea. However after i got more interested in Minecraft i decided to finish it and finally release it. Now i occasionally play and keep the Pack updated while still being maintaining a fast update speed and level of quality with the Pack. Are you open for requests? Maybe, Mod support is kinda hard to do alone as i don't have infinite free time and Mods do update often. However if you would like an Addon feel free to ask and i might add it if i like the Idea. You can find a list of the Features and Addons on the Features Area on the Website. For the Downloads visit the Downloads Section on the Resourcepack's Website! Thanks for wanting to show your support by showing other people that you like my Work! Some Textures were made by Affinite. The Beautiful and smooth Wood Texture used as a Base was made by jojojea86. HiTeen for some Item Textures and other small Textures. Vattic for using some Textures from him as placeholders and also for his Idea of making an Faithful Resourcepack. Looking at the Configurations of CTM from Misa's Texturepack helped me learn advanced CTM. The 3D Ladder Model has been made by jadenPete. The Wheat Item and the Prismarine Shard Item have been created by Misur . The Main Code of the Grass-Block Model in the Better Scenery addon has been created by JWire. My Friends and everyone who commented giving me constructive Criticism! if you want proof go ahead and ask me or him. You must specify a link on this topic in their publications. If your package contains more than 80% of my textures, you have no right to publish them. If you use this font in your texture pack, please remember to clearly credit "d3fin3d" and link back to this thread. Please ensure that both the credit and link is clearly visible within your MCF thread / PMC page / landing site. Things that are fine: - Use as placeholders. - Using as many textures as you've made yourself. - Using the items or paintings. - Use as base for mod textures. Requirements: - Give clear credit. - Link back to the Faithful 32x32 thread. - Be honest about what you are using. - No money making links. I made alot of my Own , especially the CTM. , i only took some textures from HiTeen,s since these don,t look so good in my opinion , and since Affinites Texturepack is from Version 1.4.6 there is alot of stuff i had to make myself. You need to remove what you didn't make yourself, or don't have permission to use. Just because someone wasn't reachable to get permission from doesn't mean it's OK. In fact, it means the exact opposite. If you don't explicitly have permission to use someone's work, then you cannot use it. That's how copyright works. Please be a good person and do the right thing. I'd hate to have a moderator remove this for copyright infringement because you decided to use textures that don't belong to you. why do you use commas for apostrophes? Very interesting pack, but for some damn reason I want to stick with Faithful. Nothing is wrong with the pack, it's just Faithful has a lot more compatibility and it updates more often. idk how to make these lol. Seriously, and stop putting spaces before comas. It makes you look like a child just learning what a keyboard is. Which is the sad part. Do I need to put this file into another folder somewhere, or can I just unpack, then compress the file as a .zip? Yeah, i see But thanks! Love your txt Keep the good work man! Yes! Everything is working now, big thanks to you! Keep the good work! EDIT : Btw! I think.. Maybeee remake the redstonelamp texture? Do it more " Default " If u know what i mean. Of course it's up to you! When will you start with new textures you said :D? OMG! Freaking awesome! No words! EDIT : If u can please do cactuses more green If u know what i mean! And i got a question, why can't i see peoples skins? I mean those people who have premium. Second question is, why does'nt rabbits have any texture ;c? The same with grass xD It looks weird XD Keep up the awesome work! Lol how do you know im from poland XD? Yes! It worked! Thank ya! Can you add the alex skin? Not all people have the steve skin. Great pack! May I ask what is the Skymap thing? It doesn't have a before and after gif, is it constellations?